...and it's a Christmas card! Go figure, right? When I saw that my friend Lesley had posted a Christmas sketch challenge on her blog, I was immediately inspired to create. She's calling it "Merry Monday" and the goal is to make a Christmas card every week this year to get a head start on your holiday cards. CLICK HERE for all the details. Lesley's sketches ROCK!! Admittedly, I was getting a bit tired of Christmas cards, but MY cards were late this year. Some still need to be sent off, actually..shameful, I know. I think I can really benefit from Lesley's challenges. Although this is a Christmas card, I tried to shake it up a bit with some non-traditional colors. I used the (ret.) Jolly Old Saint Nick stamp set paired with some new goodies from the upcoming SU! Sale-A-Bration event, which begins January 24th. You can earn the Everyday Enchantment DSP and Everyday Enchantment Ribbon and Brad pack for FREE with a qualifying order. How cool is that? Thanks for stopping by! 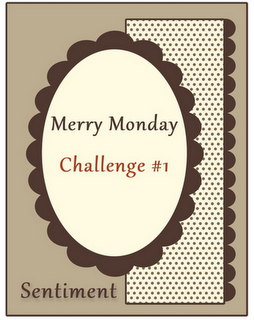 I hope you get the chance to check out Lesley's blog and play along in her Merry Monday challenges. Have a very HAPPY day! Oh my goodness! What a gorgeous way to start the year! I love it! I'm still cooking up some ideas in my head; I can't believe that I'm even THINKING about a Christmas card! Owen is super duper adorable! I love him! Hahaha...laughing at Rita's comment. Your card is so wonderful! Love the new DSP and the mix of old and new! This is really cute AM, as is your owl...wow I am envious, you know my whole classroom is all Owls...just saying! Thanks for joining me and for getting ahead in the Christmas card race! So cute! LOVE all the pearls on this and also that beautiful brad. Very pretty card. And you're one jump ahead of a lot of us on Christmas cards now! This is a cutie! Love seeing the new stuff! And that Lesley is amazing - great idea to get started early because I never am ready for the holidays! Adorable card, Anne Marie! I love this new DSP! 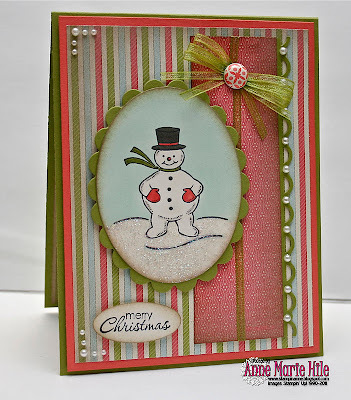 I really must get on this snowman stamp thing they are pretty cute, great card and I like the fun colors. Beautiful and a wonderful way to show the versatility of this DSP! While I really need to join you in this, I think I need the mental break from Christmas for about a month (that only puts me 4 cards behind, right?)! Your owl is adorable! Such good friends! My oldest DD LOVES anything owls! So cute. Love the really non-traditional colors. I like this idea. I tend to get burned out right before Christmas when I have to do card after card after card ..... Spreading it out over the year sounds like fun. This is so cute and I just love little snowmen. Love the layout and the colors. The sponging and the sparkle and so perfect for this little guy. Love it, the colors are fabulous! I am very envious of that sweet owl, very cute! Love it, Anne Marie! The snow is just fantastic! Isn't Lesley Wonder Woman Extraordinaire? I hope to play along with her challenge later this week (or tonight, if I have time). 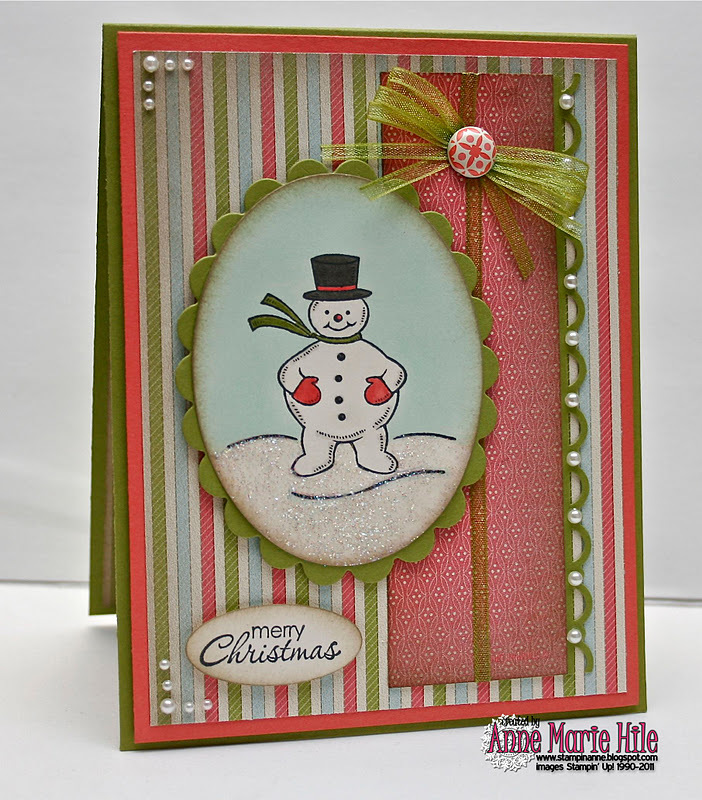 Your snow man card is so cool with the Dazzling Details snow. Another AM original. I'm so loving your gift. I love owls! He's so cute I had to Pin him. Happy New Year! That's a great idea to build up your Christmas card stash! I love your card, especially all the pearl accents you added. Happy New year to you, Anne-Marie! I hope your holidays were wonderful and filled with many blessings! Your card is just divine, as always! Such wonderful and happy cards you make :) TFS! This card is really pretty - gorgeous paper and ribbon!! I love that cute image too! Love the Snowman Card. I also love that new paper and ribbon bundle. I just love the Pic of Owen, I am glad you love him so much. I am sure he is Happy in his new Home!! Ann Marie this little guy is such a cutie. I really like the nontraditional colors too. Love the dazzling details to add some sparkle to the "snow"! So cute. Your little owl is adorable.. and you know I like owls. What a great idea to make a card a week for a year. PS: I know what you mean about being 'done' with Christmas cards, but you are going to be sooo darn happy next year! your first Christmas card for 2012 is adorable!! love the dps and colors. Pretty card Anne. I do love the glitter on the snow below the snowman.